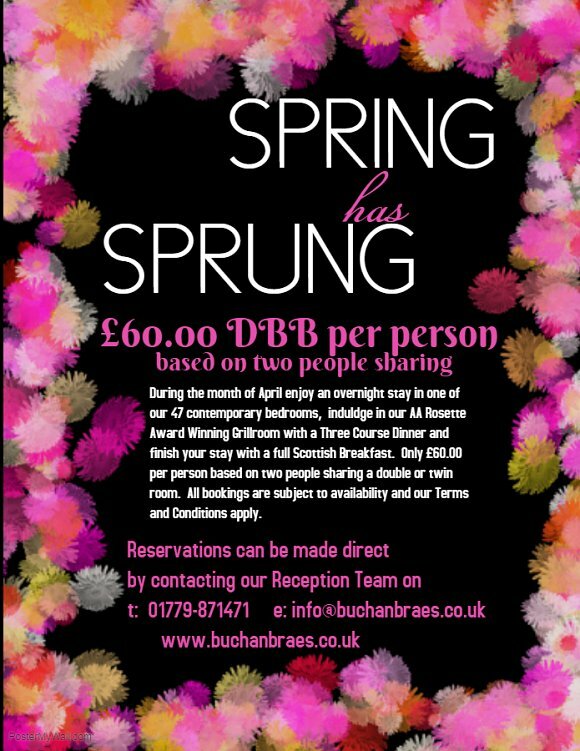 Stay at the modern 4-star Buchan Braes Hotel and enjoy the delights of the Buchan Coastline. We are offering one nights accommodation in one of our 47 contemporary designed bedrooms, including full Scottish Breakfast for only £60.00 per person. A 3-course dinner in our AA rosette restaurant on the first night is also included in this special offer price. Guests will have the option to order from a 3 Course Table D’Hote Menu or receive a £25 Meal Allowance Each. Buchan Braes Hotel is the perfect base to explore the local area, visit Aberdeen or play golf at one of the many local courses. Offer available on any Thursday, Friday, Saturday or Sunday throughout April. Price is based on two people sharing a room and subject to availability. receive the Buchan Braes news straight to your inbox.